Storhy simplifie la gestion des données RH. Fini la charge administrative, les feuilles Excel, les « entre-deux portes ». Storhy simplifies HR process and data management. Les descriptions du poste de l’employé, son contrat, et les informations reliées à son travail sont à sa disposition. All personal and functional employee data is conveniently stored and managed from one location: contact details, CVs, certificates, contracts etc. Employees can self-manage their profile information with or without HR’s permission: contact details, insurance, banking, dependents etc. Employee’s job descriptions, contracts and other details are readily accessible for view. The information specified may be directly entered into the solution. A document storage feature is also available for additional information that may be useful to your company. How is the employee information presented? Each employee has access to the solution. There he enters his information and submits his requests to HR. The information is presented differently according to its type: table, calendar, form, etc. Try Storhy for discovering the same visually! Can employees change any of their personal information by themselves? Yes and no. It depends on the information under consideration. Employees must initiate a change request to HR for any personal record changes such as: change of civil status, contact details, dependents, banking information etc. Once the HR mamanger is informed (see the Tasks and Alerts page) requests are validated and the changes effected. The employee can make changes without HR approval to areas such as his CV (professional experiences, areas of expertise, languages, education, degrees, etc.). Are there different levels of access/permissions that can be established? Yes! Storhy offers 4 levels with different permissions: employee, manager, supervisor (manager of the manager), HR Generalist. Find out more about this on Storhy’s unique work spaces page. How much data can I store in Storhy? As much as you want! We don’t pre-set storage limits. As such, you’ll have all the space you need. The only limit is the size of the file that you can export: 600 Mb. For example, you cannot import an hour and a half long movie in Storhy. But the trick would be to break up the film in several parts! Find out more about this on Analyses and requests page. Yes! Storhy is available in French and English. Each employee chooses his preferred language. These two languages are included in your offer; you do not have to pay any extra charges. It is possible and it is free! You’re only invoiced for active employees, i.e. the employees who have access to Storhy. 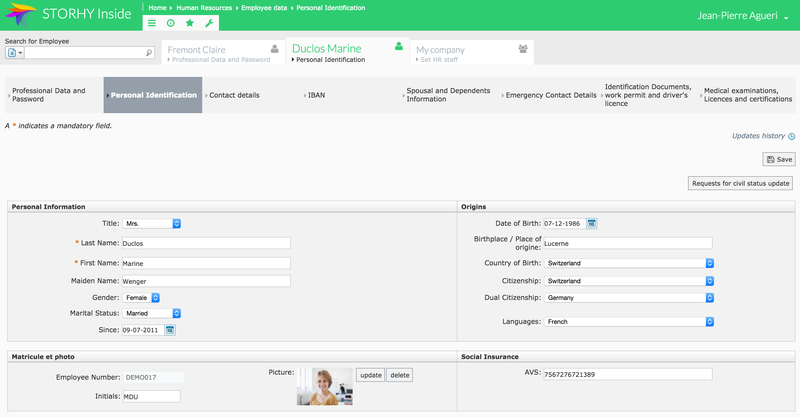 You can create an employee record for someone who will be joining your company in a few weeks. Can I limit access to certain documents that I place in employee files? It is possible! When adding a document in an employee’s file, you can decide whether it’s visible or not to the manager and the employee. Is is possible to capture and maintain historical salary data? It is possible! Storhy allows you to store the salaries of each of your employees month by month, in various currencies. Can I maintain historical data for all training sessions? It is possible! Storhy offers you a dedicated training sessions’ page: you edit the list of available courses for your company and then you assign them to the employees they pertain. Can I fine-tune Storhy's vocabulary to match ours? Yes, it’s possible! Your HR administrative manager can be granted permission to “edit the lists”. This will allow for changes, removals and additions to the choices that your employees see in a list. For example, the list of authorisations, training sessions or currencies etc. Feel free to contact us with other questions. We’re here to support you and ensure your success! Less paper, more time and better managed process for employees and managers.